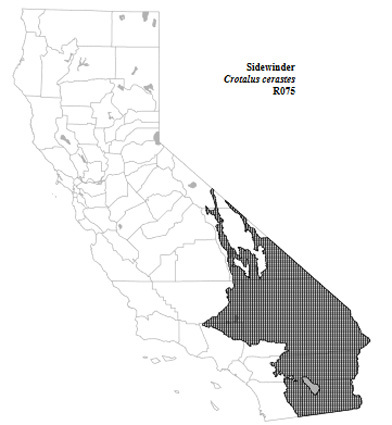 The sidewinder is widely distributed and locally abundant in the Colorado and Mojave deserts and north just into the southern Great Basin. It is found from sea level to 1800 m (6000 ft) in a wide variety of desert habitats, including woodlands, shrub types, barren areas, and dunes. It is most abundant in desert washes and flats with shrub cover and wind-blown sand, especially at the bases of bushes where the snakes often wait, partially buried. This snake is active from mid-spring to early fall, but activity may be restricted during the hottest part of the summer (Cowles 1945, Klauber 1944, 1972, Lowe and Norris 1950, Stebbins 1954). Feeding: This snake eats small mammals (Dipodomys, Perognathus, etc. ), lizards (Cnemidophorus, Uta, Uma, Phrynosoma, etc.) and occasionally birds (Stebbins 1954, Klauber 1972). It is an active forager, but it also waits under bushes for prey, partially buried in sand. Cover: This snake has a set of behavioral and morphological specializations for living in sand. It normally buries itself in a coil in fine sand at the base of a bush, if available, or in the open. It may occasionally use mammal burrows or surface cover objects. Reproduction: Young are live-born and probably require a safe and secure place for birth. Rodent burrows are probably utilized. Pattern: This snake occurs in a variety of habitats that are characterized by the presence of wind-blown sand. Rarely, this species occurs in rocky or non-sandy habitats. Activity Patterns: This snake is primarily nocturnal, but in the early spring it is active at dusk and even occasionally during the day. It is active from early to mid-spring until late summer or early fall. Populations of southerly or warmer areas become active earlier. It sometimes ceases activity in mid-summer, when temperatures are highest (Stebbins 1954, Klauber 1972). Seasonal Movements/Migration: Not known to migrate. Territory: Males may be territorial but evidence is not clear (Lowe and Norris 1950). Reproduction: Copulation occurs shortly after emergence in April and May and the young are born in mid-summer. Litters average 11 young and range from 7-13 (Stebbins 1954, Klauber 1972). 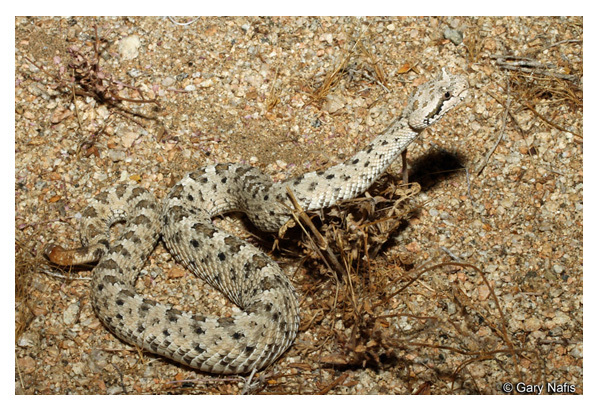 Niche: This snake is eaten by kingsnakes and roadrunners, and probably by most avian and mammalian desert predators. The Sidewinder measures between 18-30 inches long with a gray, brown or yellow body. Its common habitat is sandy, creosote brush areas. It’s prey consists of lizards and small rodents such as the kangaroo rat. One of the most truly interesting animals that have adapted to the desert environment, the Sidewinder is suited to living in sandy conditions. Unlike other snakes that crawl using bottom scales to push themselves along the Sidewinder throws its head in front of it’s body, uses it as an anchor, and pulls the rest of itself along. This is a very efficient way of travel across sand dune habitat they live in.